Very cute idea for a darling door hanger. 8 inch heart doilies (white) 3 for this project. 3-8 inch hearts cut from construction paper (all different colors) I used red, pink and purple. First cut your hearts to fit your doily. I traced mine using the doily and then cut a pattern. Glue one doily to each of the three paper hearts with a little bit of glue from the glue stick to the construction paper hearts. 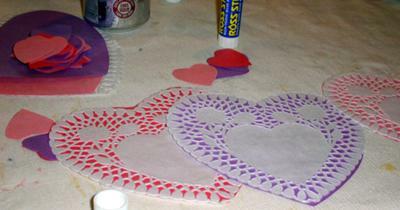 Glue one of the small hearts in the center of each of the large doily on construction paper. Embellish with tiny colored fabric rosebuds to the center of the smaller heart. I hot glued these as they are a little heavier and I wanted a firm setting and to make them lay flat. Glue all three hearts to a 12 inch length of floral ribbon. Make sure each one is separated equally and pasted straight onto the ribbon. You can embellish these however you like but I really wanted a very feminine door hanger. Suggestions would be small colored ribbons made into a bow, a pretty button or any other item you deem beautiful and useful. Not only easy to do, but also look amazing.